Contrary to certain reports which claimed that the Government Agent (GA) of Jaffna had put a stop to the construction of a Lord Buddha Statue, it has now come to light that the Government Agent had requested Ven. Padumakiththi Thissa of the Nagadeepa Rajamaha Viharaya to obtain approval from the Coast Conservation and Coastal Resource Management Department before constructing the statue. This is contrary to some media reports which claimed that the Jaffna Government Agent N. Vethanayahan had stopped the Nagadeepa Rajamaha Viharaya from constructing the Lord Buddha Statue. In a letter dated 21st March 2016, the Jaffna Government Agent who is also the District Secretary informed Ven. 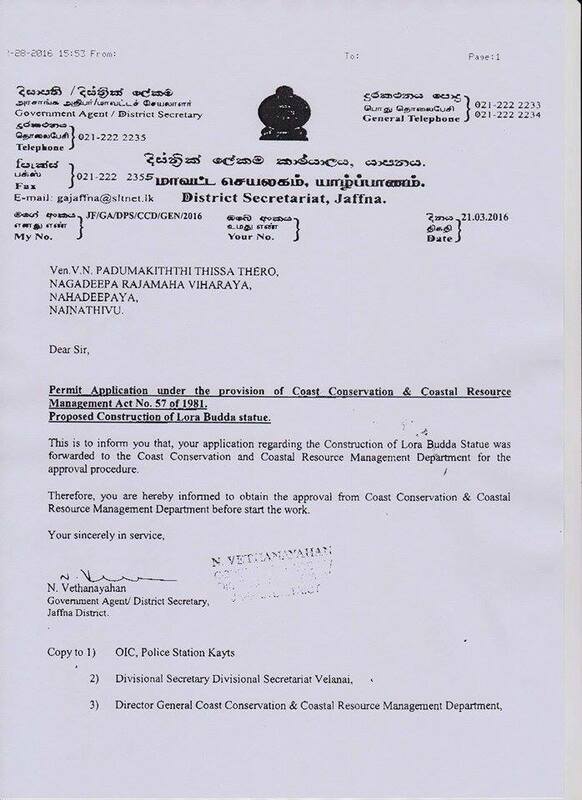 Padumakiththi Thissa that his application regarding the construction of the Lord Buddha Statue had been forwarded to the Coast Conservation and Coastal Resources Management Department for the approval procedure. “Therefore, you are hereby informed to obtain the approval from the Coast Conservation and the Coastal Resources Management Department, before starting the work,” the letter stated. However several news media, including national newspapers and online media claimed that the Jaffna Government Agent had halted the construction of the statue. Some reports also alleged that the Government Agent had links with the LTTE hence was acting in this manner. Now there is no LTTE and Sinhala soldiers are no longer killed, therefore, the Sinhala Buddhists are working hard to come up with an excuse to resurrect 1983!! If the current regime fails to stop this nonsense, the separation of this country is inevitable eventually. What started in 1983 ended up in 2009. Not separation. LTTE didn’t just disappear. SL soldiers wiped them out. 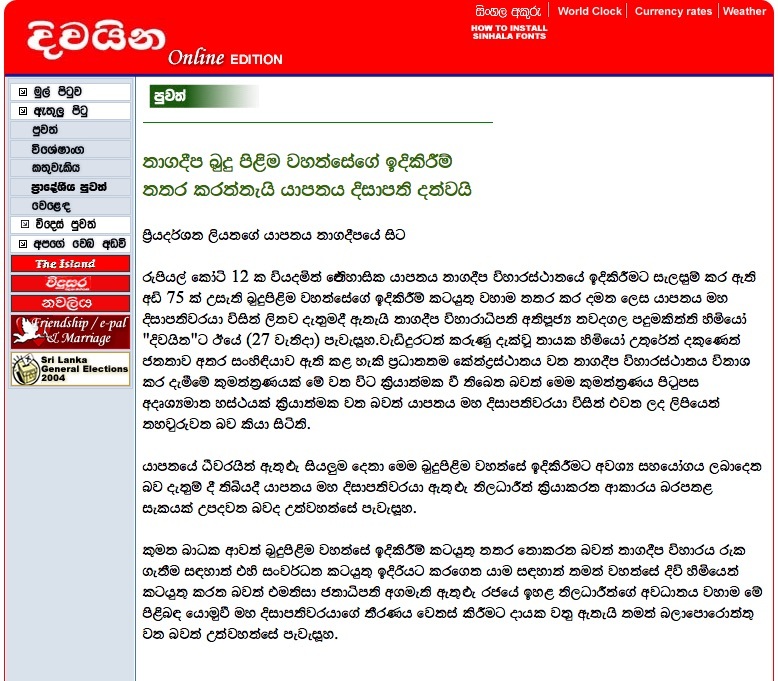 muslims the pirates looted Colombo and what has that got to do with 2009 elsewhere? For the sake of communal harmony the government mustn’t get engage in highly sensitive religious affair. Who care about a statute, just a piece of rock and the protestors should ignore this for peace in the country. How stupid can people be. See what is happening in the Middle East and our Ambude clad politicians must grow up to the modern life without deceiving the people without living a double life. In the name of communal harmony let them break our rules of the Coast Conservation and Coastal Resources, let them not find a political solution, let them continue to occupy hundreds and thousands of acres of private land in the NE, let thousands of displaced people continue to live in the welfare centers in the NE, let the killers of Trinco 5 students and Mutur 17 aid workers go scot free, don’t touch the criminals who made the surrendered cadres naked, kicked and shot at point blank………the list continues! Is this what you are suggesting, I wonder?! At keeramalai hot pools, I have seen a group of Buddhist monks has erected a tent and playing “Daham Panivuda” using a loud speaker and asking people to contribute to construct a temple and preserve the ownership of the Buddhists to that place. I cannot understand the feeling a local Tamil get. I cannot understand the ownership of Buddhist when “thanha” leads to “Dukka”. Is religion business? Nothing new, you know the Berai lake flower road. They planted bo trees in important lands with the assistance of UDA nationalist presidents and PM that even the most influential Sinhalese had to back off. they say the colonist built churches and took away the best land now its our turn. A portion of it is leased out to non Sinhala tamil muslim business. They are know to take the plum of most foreign aid government contracts- that is how they get their duty free limo’s. Its the first tier army without guns but balls. IF they have a web site, people can send money. How many Buddha statues does this small island need? If we put a lot of sand and gravel into so many Buddha statues, what will our future generations have to build huts/houses for them? Learn about the disasters of riversandmining and seasandmining. How many Kovils does Srilanka need? There are plenty just 40 km away in Tamil Nadu. Jaffna had 4 mosques by 1990. They must be erected for harmony and peace. You may be interested to know that Sinhalese Buddhists can be more Hindu than most Hindus. The Buddha, they respect very much, but he has only sound advise to offer. He was no respecter of astrology either. Being the superstitious lot that many Sinhalese Buddhists are, they make vows to Hindu gods who can be ‘bribed’ into action. So it is hard to wind up the Sinhalese Buddhists about temples as they are quite comfortable with them Gods here than having to get visas to visit them across the Palk Strait. I am happy with any religion as long as nobody makes loud noises over the megaphone and disturb my peace any time of the day. go back to Palestine and kiss the floor. Gass Gembos have a national begging bowl for the idle baldies. BTW you come off a pirivana too! Can anyone count the number of Buddha statues erected in the North in the last 7yrs – didn’t think of counting the many news tems streaming in over the 7yrs. sinhala buddhist are following history. In 400 years the mughals destroyed every temple in the north of india and built mosques with the same stone( you can notice the stones easily). Only the iron pillar remains at delhi because they did not know how to destroy it. Therefore the indians travel south to tamil nadu on pilgrimage. Diva ins editor should be sanctioned by the Editors Guild for this gross negligence of professional accountability. He should have find out from the reporter as to whether he has cross checked with the GA before printing this misleading information in Divaina. Shame on the Editors Guild. Construction of Buddha statues does not make people, even those calling themselves ‘buddhists’ , ‘more’ religious. Already, hundreds of Buddha statues have been erected even in places with no habitation, and in places where no Buddhists live, especially in the northern province. Does this serve any purpose, except to intimidate non-Buddhists. Those erecting the statues will be better citizens and better Buddhists, only by following the teachings of the Buddha, in their attitude to others. What is practiced in Sri Lanka is not Budhism! It is pure and simple hatred and egoism. No wonder there is so much killing, rapings, bribery, corruption, drug trafficing and theft. The money spent on erecting Budha statues in every nook and corner, could be spent on helping the poor and disabled and the homeless people!! In the North they are stealing the lands and houses of the poor. What is the use of erecting statues? Someone must be making a lot of money in erecting these statues and temples! Idiot Jaffna GA is a racist. He spelt NAGADEEPAYA as NaHadeepaya. There is no place called Nainathivu in holy Sri Lanka, there may be a place called Nainathivu in Tamilnadu. Sack Jaffna Government Agent Vethanayahan immediately. North and East where early SINHALAYAS lived. Ruthless Tamil invaders grab Sinhalayas’ land and push them to the southern part of the island. Hello David, As a Sinhalese, for this occasion, I welcome your nationalism! A piece of advice, though. 1) Give up your name. Choose an indigenous one that would go with your mission. 2) Be like a true Buddhist. Don’t call him an Idiot. That is your prerogative. Why waste it on him! Agree. He also spelt Lord Buddha incorrectly twice. fathima,you say, “He also spelt Lord Buddha incorrectly twice”. So what? As a Buddhist I say what if someone spells Buddha’s name twice or even 3, 4, ad infinitum? Were you concerned when the Taliban destroyed the statues of Buddha? I don’t think so. You were perhaps hiding inside your Abaya and laughing your guts out. We are not like you. You know that your people prime your nuclear weapons when Prophet Mohammed (PBUH)’s name is even mentioned by an Infidel. Am I wrong SIS? why don’t you keep your ideas restricted to your own community or throw it to away with the DAtheISH and the Bottles that they are bottled in? David,I disagree with you.This country was a Hindu country until Mihindu thera came.There is evidence to that effect -Re the Temple at Dondra where a head of a Siva Statue was unearthed.Even the Kandy temple has a few practises from the Hindu stream.The Gods that we worship are Hindu Gods, however much the safron robed gents attempt to teach us otherwise. What happened to the Hindus of SL is the same story that the Red Indians in the US had to face. Even Vijaya, if there was such a person was a Hindu, a fact which the Safron Robed tend to suppress. Dutu gemunu was from Hindu stock.He muerdered Ellara, which again the safron robed brigade mispresent. The Sinhala caste system is a continuation of the Hindu caste system. David please do not carried away with what the safron Robed guys tell. They have an inherent interest in subverting history. Why was the letter written in English? It should be written in pure Sinhalese! Sack Jaffna Government Agent Vethanayahan immediately! You ask, ‘Why was the letter written in English’. That is a good question. And, you demand, ‘Sack Jaffna Government Agent Vethanayahan immediately’. That is good too. But, shouldn’t your demand be, ‘Sack the idiot who appointed Vethanayahan as the Government Agent of Jaffna, immediately’, so that you don’t have to keep on demanding the same, when a new GA is appointed! You can not blame Divayina journalists who created this news with ulterior motives. They learnt all these tricks from Mahanama Thero’s ” Mahavansa”. They want born again Gemunu MaRa to come back to power at any cost to the future of the country. This will pave the way for MaRa Bros & Co to re mortgage the country and enrich themselves. That GA was insensitive culturally and disrespectful. He addressed a buddhist monk as a sir. Most probably, that guy did not know even english. HE has Written Lora buddha. Just an idiot GA.
Ven. Padumakiththi Thissa of the Nagadeepa Rajamaha Viharaya (=the leading monk?) doesn’t know where to apply for necessary permits or maybe he thinks that no permits are needed. You suspect that he doesn’t understand English. Please let us know what are the skills these leading monks have or are supposed to have. I am not saying that other religious leaders are any better. Imagine you share land and police powers with these people! Jaffna had 4 mosques in 1990. Only 1 is allowed now. How about the other 3? The type of journalism CThas exposed in this instance is not the first and the last of its kind. Whenever a tangible and acceptable solutions are contemplated, formulated and attempted, such malevolence is let loose by extreme elements from the political and religious platforms and through the media. Such an occasion has arisen again. Lies , bloody lies, exaggerations and distortions become an art to destroy the emergence of possible solutions. History is repeating. Extreme fringes from all communities are coming to the fore and are at play. Sections of the media are also playing their nasty game. The moderate, rational and decent elements from all communities should come forward to prevent a repeat play of history and permit the emergence of an acceptable solution to the so-called national problem, that has been long delayed and denied, because of the antics of the extreme few and the media that takes up their cause. CT, please expose this perversity and prevent such attempts by individuals, groups and the media. Let the people understand the malevolence that is raising its ugly head, once again. Embolden us and provide us the forum to resist. It is the lack of awareness, silence and helplessness of the majority of the vast majority of decent, moderate and right thinking people in all communities that has over decades dragged this country into an abyss. CT please shine the light on the advancing darkness and let us see the right way. reporting of Govt. actions and it is time that the Govt. has an authority to oversee the activities of media and what they report. Buddhist must get state patronage according to the constitution. I disagree with it but that is the constitution which must be followed. this editor of Dinamina A.K.A. a ‘BOOTLICKER’ OF MR should be punished with for creating a Communal disharmony. ambude in a twist, you are stupid with foot in the mouth. the GA has followed administrative procedure for built environment. Even if it was a church or mosque they have to follow these principles. Racist` go refer the encyclopaedia as to what is race, ethnic, religion. get sterilised first then you become muslim like your gene. Both your language and ethnic are concoctions like the veddha mahatays talle gulli. I never needed religion as a subject because the first man is of earth and the second is of heaven. Better build a small Buddha statue, for worship, and save money to help rebuild the poor community.That is the right path.Some Buddhist monks are obsessed with building colossal statues.I,m tired of seeing Buddha statues every nook and corner with little respect.This is not true Buddhism. Please spare a thought for Jaffna Muslims who had 4 mosques in 1990. Today only 1 small mosque is allowed. If this is not racism, nothing is. SL constitution says Buddhism gets supreme place. I don’t agree with that but at least the constitution must be enforced. Why should a Buddhist temple need to seek approval from a GA? If this is how Buddhism (supposedly with the supreme place in the country according to constitution) is treated by Tamilians, imagine the plight of Muslims and Christians! In Colombo every suburb has a kovil. What Tamils do in their own land is no concern to you. If you want to build more mosques that what is necessary, just to spread your extremist Salafist ideology go to Pakistan or Saudi Arabia. You will fit in there very well. Please visit Jaffna and count the mosques. I know at least three mosques. Maybe all 4 are now open? There are two that have reopened near Osmania College. Any further construction of statutes , be they Buddha, Hindu or Christian should be stopped.